Apple launches the Mac App Store. The store comes as part of the OSX update to 10.6.6. I’m on vacation for a few days and the OS update took a crazy 3 hours over hotel wifi, but I suspect at home in SF, it would’ve only taken about 20 minutes. 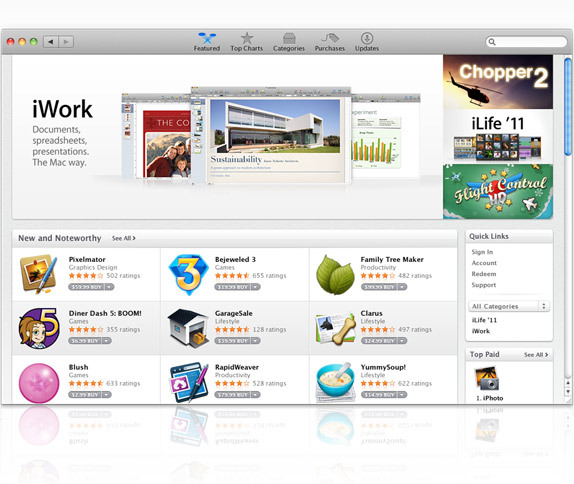 The app store is another standalone app like iTunes for your desktop. iTunes is already bloated, so I don’t necessarily want the app store to be part of it, but it does feel extraneous to have another OSX app just for this store. At launch, there are over 1000 apps, but we’ll have to wait a bit until more software makers switch over and make their products available in the App store for it to truly become the place for Mac software. The store itself operates much like the iOS store, but it’s a major switch from the current state of Mac software, where we’re used to downloading the DMG and install the application locally. Once you buy/install the app from the new store, the download and install takes place seamlessly. Once done, the app icon animates out of the Mac App store and pops its way into your dock and you’re ready to use it. For now, I’ve downloaded the free Twitter for Mac (new version of Tweetie for Mac) and yes, I caved and bought Angry Birds to see it big screen ($4.99)!